Rally to support a budget appropriation for PreP. Photo by Daniel Hirsch. 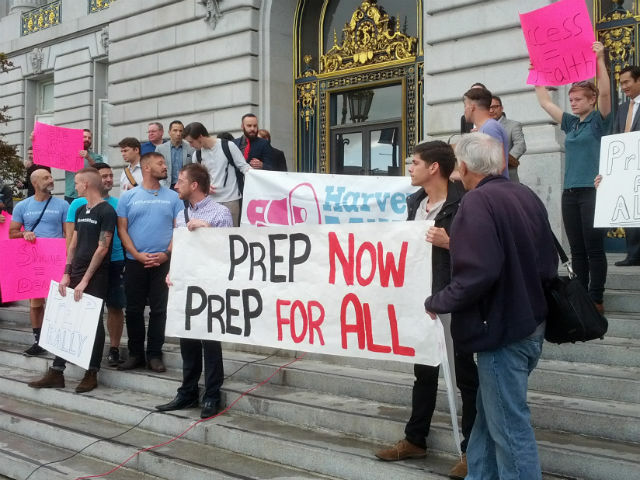 After a rally today outside of City Hall to support a budget appropriation to increase funds for greater accessibility to PrEP (pre-exposure prophylaxis for HIV infection), Supervisor Scott Wiener acknowledged he had been slightly anxious leading up to today. Yesterday, in a post on the Huffington Post , Wiener had “come out” as the first elected official to use the drug. Truvada is an antiviral pill that, when taken daily, is used to help prevent HIV infections – a drug for pre-exposure prophalaxis (aka PrEP). It’s been recently endorsed by the World Health Organization as a means of significantly decreasing the rate of infection. While today’s rally was to support a budget appropriation of $800,000, sponsored by Supervisor David Campos, to pay for subsidies to San Franciscans who cannot afford PrEP, it was also a further step in easing the stigma against the antiviral pill. As the New York Times profile of Wiener notes , there were 359 new HIV infections in San Francisco in 2013. Whether or not because of stigma or lack of knowledge, there were only about 1,000 active prescriptions of Truvada in San Francisco in that same year. Wiener also said that part of that equation also should include condoms, and that the drug isn’t for everyone. PrEP only acts as an antiviral for HIV, not for other sexually transmitted deceases. While PrEP has been slow to catch on in the population, it’s not gone unnoticed by insurers. The drug is already covered by several insurers, but many federally funded programs to treat HIV don’t yet proscribe PrEP. The budget item to be introduced at today’s Board of Supervisor’s meeting, will help get PrEP to those who fall through the cracks. The funds will go towards co-pay assistance to those who can’t afford the drug on their own and subsidies to those without insurance. The measure would also create a “navigator program” to help those seeking PrEP figure out how they can get covered for Truvada. At the rally, representative from non-profits who work with populations more vulnerable to HIV exposure also spoke. Adam Zeboski, who works at the San Francisco AIDS Foundation, also spoke at the rally. Social media mavens may know him better as the originator of “#Truvadawhore,” a meme started by Zeboski to battle a tide of stigma against the treatment. As an early adopter of Truvada in 2012, Zeboski says he’s seen some pretty nasty insults against those on the pill (“Truvada Whore” being the most common one, which he chose to cheekily re-appropriate). However, things have changed in the last year. For one, Zeboski says he’s sold more than 400 t-shirts with the provocative hash tag printed across the chest, which many at the rally proudly wore. He also says he doesn’t get accused of promiscuity or irresponsibly spreading HIV. The budget measure will be introduced at today’s Board meeting and Wiener says he’s optimistic about it passing. NextMuscle Mile: Gyms Replace Altars on Mission St.
Let’s see been out since 2012 and there are only 2,000 regular users of it. Hmmm, gee maybe its because most people would rather simply wear a condom then take a very serious HIV medication, while completely healthy, every day for the rest of their lives… It doesn’t block any other STDs either so, not really sure what the point is, except $15,000 in the pocket of Gilead. It also has all the typical side-effects of heavy anti-viral medications. And let’s not pretend Wiener isn’t doing this solely for his own PR a la Gavin Newsome. Its feather despicable to take a serious global health issue and twist it for your political gain. But of course I expect that from a politician. If someone wants to take Truvada, fine. The question here is whether the taxpayers of SF should pay for it rather than paying for other things. We have a housing shortage, a crisis of homelessness, inadequate public transit, underserved school children, and people who can’t afford the medicine they need for illnesses they already have. Why should we pay for this before we pay for other needs? Because prevention in all forms will save the Department of Public Health a lot of money in the long run — treating HIV/AIDS is very costly.